From the moment my taxi pulled up at the front of Stokehouse I just knew that this was going to be a great evening. It’s an appealing modern structure right on the river. The area was developed after the 2011 Brisbane floods and Stokehouse, from the same people as Melbourne’s Stokehouse, opened its doors in late 2012. The food is modern Mediterranean, using local and Australian produce. I was still just as excited when I got inside – a beautiful outlook with views back towards Brisbane city and the Storey Bridge, with ferries chugging back and forth just to complete the picture. It was a perfect warm night and the entire front of the restaurant was opened up so it was almost like outdoor dining. I was first to arrive so what better thing to do while I was waiting than check out the wine list. It’s a great list with a few of my SA favourites – S.C. Pannell, Torbreck, Gemtree and Brash Higgins – all at very reasonable prices. I took the liberty of ordering a bottle of Brash Higgins Grenache Mataro to start with. I just love their wines, and those two varietals. The food menu was good too. I was expecting it to be mainly seafood but there was a bit of everything on offer – pork, chicken, beef, fish and shellfish. We found it quite hard to make decisions. 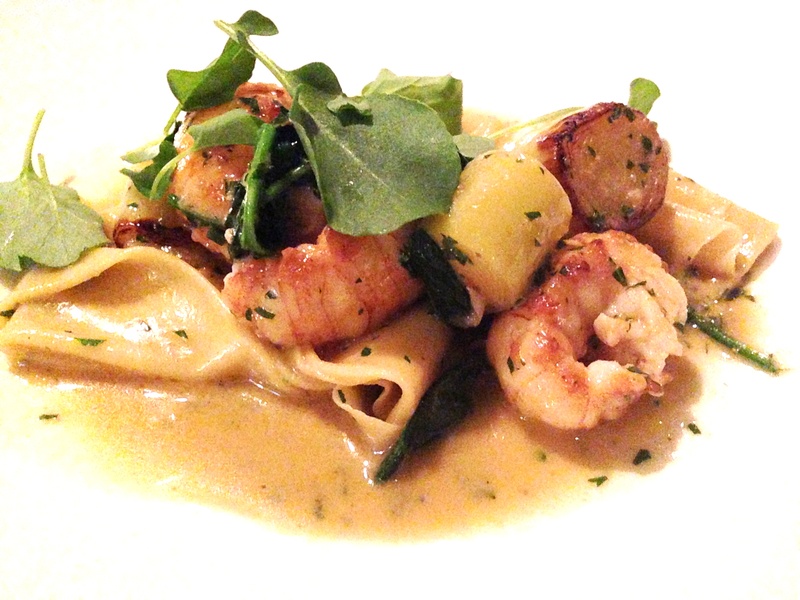 For my entree I decided on the Moreton Bay bugs, braised leeks, whole egg fazzoletti and seafood butter. The seafood butter sounded too good to pass up and I do love a good bug, so it was the perfect choice. Main course was a harder decision and it came down to either the Blue swimmer crab meat with squid ink linguine, tomatoes, basil and lemon, or the Market fish, spring bay mussels, cucumber and ale vinaigrette. The market fish for the day was swordfish but I’m not really a fan. I hate to be one of ‘those’ diners but I noticed there was also a perch dish on the menu and asked if I could have the market fish dish with perch instead. They were happy to accommodate, so that ended up being my choice. My dining partners ordered the Kingfish crudo, the crab linguine and the Beef City Black eye fillet, salardaise potatoes, roasted shallots and oxtail jus. We also went for a couple of side dishes – the Hand picked green beans with Turkish dressing and the Baked field mushrooms, chilli, garlic, anchovies, fresh herbs and vincotto. The bug dish was excellent. A relatively large entree with 3 big pieces of bug sitting on house made pasta with rounds of soft leek, and a rich seafood butter. This got two thumbs up. I really liked the Perch too. I’ve only recently become a fan of ordering fish in restaurants and I’ve discovered that most places do it really well. The linguine was also a good size with a generous amount of crab meat, al dente pasta and a buttery sauce full of flavour. It was time for a second bottle of red and we chose the S.C. Pannell Syrah. Another tasty drop. The eye fillet of beef was cooked perfect medium rare and the oxtail jus was deliciously intense – my dining partner rated it a 10 out of 10. Even the sides were pretty exciting. The Mushrooms were so good – anchovies, chilli and garlic are a great combo, and the beans were beautifully cooked. I would definitely recommend this place – it’s got everything going for it. Location, view, great staff, great food and good wines at reasonable prices. It’s currently sitting at number 100 on the Top 100 list and hopefully it makes it further up the list next year. This sounds delicious and the picture looks mouthwatering. But I have to ask -what is a bug?? At first I thought it was a typo. Is it a term specific to Australia? The Stokehouse in Melbourne was a favourite – Also where a good ‘Kiwi’ mate introduced me to the wonder that is Cloudy Bay! Since then I’ve managed to share a few bottles with a few friends all round the world! Including one with you overlooking the Derwent I seem to remember!